Since 1904, we’ve led the island in providing sporting opportunities for people of all ages and levels of competitiveness, encouraging adults and youths alike to take part in our programs regardless of previous experience. In addition to our official club offerings, we also rent out our popular outdoor pitch and spacious gym for non-B.A.A.-affiliated events such as corporate or private football matches. BAA was directly responsible for the particular introduction and development of football, swimming, track and field athletics (hence our name), badminton and rugby. It has proved to be a leading light in many other sports now enjoyed throughout the island. As Bermuda has developed the club has changed with the demands of the time. However, the role of the club, its administrators and its players must not be forgotten. May 1904 – nine boys under the leadership of Mr. L. Reginald Motyer formed themselves into “The Boys’ Own Association”. Its purpose was to “to provide clean sport and recreation for the youth of Bermuda”. Within three months the membership was at 40 and a change to the name was deemed necessary. It became known as the “Young Men’s Athletic Association”. The minutes of 1904 see a “football” captain being chosen; this is in fact one of the earliest documentation of Bermudians playing football. 1906 – The title of the club was changed to the “Bermuda Amateur Athletic Association”, which was felt to be more in keeping with the broader aims of the organisation. travel at the time there was a terrific demand to come here to swim. 1910 – Saw further expansion of the Association’s activities to boating: outrigger, dinghy and punt sailing races attracted many members to compete. With the exception of dinghy races competitions were sponsored by the Association for its own members, and boats were entered in races sponsored by the Royal Bermuda Yacht Club, the Hamilton Dinghy Club, and the St. George Dinghy Club. Canoeing was also a major activity about this time; and there was a an annual joint regatta of the BAA. 1914 – So large was the membership and so many the activities of the Association that by 1914 it was felt necessary to incorporate. This was accomplished by the Act of Colonial Parliament, Number 8, of that year. The association was now empowered to hold real estate in its corporate name. A piece of land on Pitts Bay was purchased and became known as BAA slip. Plans were drawn up for a clubhouse there. Unfortunately, World War 1 broke out, and any such plans were put on hold. Nineteen members of BAA were killed in action in the war. Mr Robert Barton presented the club with a roll of honour in their memory. Despite the war, activity continued, but on a much smaller scale. Nevertheless, the annual Track and Field meet continued to be held every year. Post World War 1 – After the war, there was a determined effort to get things back to normal; and in 1920 BAA made the momentous step of purchasing the Woodlands Road grounds of Hamilton Cricket Club. The grounds were prepared, and almost immediately became the home for cricket, football, rugby and tennis. 1922 – BAA played host to the first visit to Bermuda by a foreign athletic team. Eight ladies from the Women’s Swimming Association of New York journeyed here to take part in a series of swimming carnivals. 1925 – BAA instigated the first Bermudian football competition as they organized a cup competition for military and civilian teams. The final saw the Royal Artillery defeat the Royal Engineers 1-0. BAA lost 3-0 to HMS Calcutta and this brought a stinging rebuke in the papers that BAA’s members were concentrating too much on rugby! As sport developed throughout the island the club’s control of certain sports was ceded to new associations we helped to form; namely the Bermuda Cricket Board of Control, and the Bermuda Football Association. In the latter case it was BAA who applied to the English FA for affiliation, as there was no local governing body for football. 1932 – BAA received an invitation to join the British Empire Games Association. We attended and since then Bermuda has been represented in every games – which became the Commonwealth Games. by a team of eight swimmers, all from BAA. mankind. BAA became a centre for competition between Bermudians and the armed forces in all manner of sports. The grounds were at the disposal of the armed forces teams free of charge. 1943 – The club was anxious to assist in the problem of juvenile delinquency that was becoming a problem on the island. To this end they appointed a full time General Secretary whose job it was to co-ordinate all factions of the club, and to emphasis the Junior program as a means of ensuring youngster have something to do! 1945 – The Association was instrumental in the formation of the Bermuda Amateur Athletic Association whose function it was to control all amateur swimming, athletics, boxing, and table tennis in Bermuda. BAA had the honour of being the first member of this new organisation. following year saw the football leagues (black and white) united into one cup competition (the FA cup). The final (in 1956) saw BAA defeat Southampton Rangers 3-1.
tournaments, and car shows: it has been the residence for the embodiment of the Bermuda Regiment in times of unrest, and has stabled horses for the Tattoo on the field from the Royal Canadian Mounted Police. The list is perhaps endless. Today, it houses badminton, indoor hockey, roller ball, basketball, and indoor football. 1963 – Blacks and whites played against each other in one league, the BFU. BAA were one of four white teams that began in that league (Nationals, Casuals, and Police being the others), and the only club to still be fielding teams. The success of teams and our involvement has waxed and waned according to who has had an interest in a particular sport. In the 1980’s BAA enjoyed a few seasons in the BFA First division, but as interest and commitment dwindled the club football is now dominated by a vibrant Commercial League team. Cricket was played until the 80’s but the removal of the clay wicket put an end to our involvement in that sport. BAA’s involvement in rugby also dwindled and the mantle was taken up by Mariners RFC. Darts has proved to be popular; with the clubhouse now being the centre for darts. 2004 – The Bermuda Government inducted Bermudians into the Hall of Fame for the first time. The club was honoured to have Mr Francis “Goose” Gosling, Mr W.F. ‘Chummy” Hayward, and Mr Keith Dunstan to be among the first inductees. These fine gentlemen were all stalwart BAA members both as competitors and as administrators. This indeed says a lot for the type of person who has been instrumental in the development of a club that has played a pivotal role in the development of sport in Bermuda. 2014 – George Sousa was inducted into the Hall of Fame. Again the club is honored to have a BAA stalwart inducted. 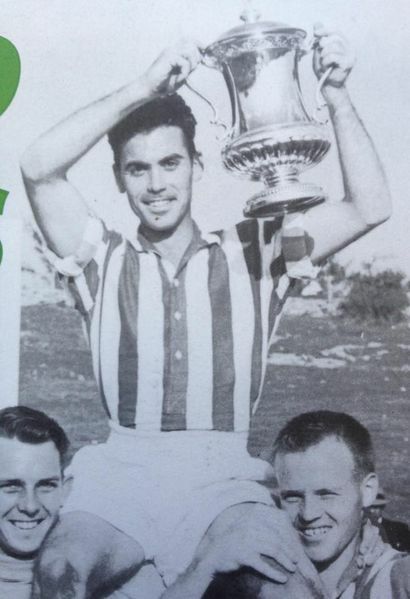 George was the Captain of the 1st ever BFA Cup Final in 1956. BAA beat Southampton Rangers to lift the trophy.